Picture - Royal Air Force Britannia C2 (Model 253) Spica in 1964. The Bristol Type 175 Britannia was a British medium-to-long-range airliner built by the Bristol Aeroplane Company in 1952 to fly across the British Empire. During development and acceptance testing, the turboprop engines proved susceptible to inlet icing and two prototypes were lost while solutions were found. By the time development was completed, "pure" jet airliners from France, United Kingdom and the United States were about to enter service, and consequently, only 85 Britannias were built before production ended in 1960. Nevertheless, the Britannia is considered one of the landmarks in turboprop-powered airliner design and was popular with passengers. It became known by the title of "The Whispering Giant" for its quiet exterior noise and smooth flying, albeit the passenger interior remained less tranquil. In 1942, during the Second World War, the US and UK agreed to split aircraft construction; the US concentrating on transport aircraft, and the UK on heavy bombers. This left the UK with little experience in transport construction at the end of the war, so in 1943, a committee under Lord Brabazon of Tara, investigated the future of the British civilian airliner market. The Brabazon Committee called for several different aircraft to be developed to specifications composed by the committee for roles felt to fulfill Britain's civilian aviation needs. Bristol won the Type I and Type III contracts, delivering their Type I design, the Bristol Brabazon in 1949. The requirement for the 1946 British Overseas Airways Corporation (BOAC) Medium Range Empire (MRE) Requirements coincided with the Type III, Specification C.2/47, issued in April 1947 by the Minister of Supply. The specifications called for an airliner capable of carrying 48 passengers and powered with Bristol Centaurus radial engines or Napier Nomad compound engines. Turboprop options were also considered, but they were so new that Bristol could not guarantee the performance specifications. Although in-company Proposals "X" for conversions of Lockheed Constellations to Centarus 662 powerplants or "Y" for licence production of the Constellation were considered in late 1946, BOAC decided that an entirely new design was preferred. After wrangling between the Ministry of Supply and BOAC over costs, the go-ahead for the project assigned the company designation Model 175 was given in July 1948. Three prototypes were ordered as Mk 1 (Centaurus 662), with the second and third prototypes designated the Mk 2 (to be convertible to Bristol Proteus turboprops, then under development). In October 1947, with work already underway, Bristol had settled on a Centaurus powered design, with an all-up weight of 103,000 lb and a payload of 13,300 lb. The anticipated Karachi-Cairo run necessitated a 48-seat limit with a requirement for sufficient fuel for the lengthy stage. On 5 July 1949, the Ministry of Supply ordered five prototypes to this specification with the understanding that BOAC would contract for an additional 25 production examples. BOAC purchased options for 25 aircraft on 28 July, to be powered initially with the Centaurus engine but to be re-fitted with the Proteus when available. In November 1948, the Type 175 design was revised again to accommodate 74 passengers and a longer span wing in a contemplated long-range version aimed at long-haul Empire and transatlantic routes rather than the medium haul Empire routes originally planned. On reflection, BOAC decided that only a Proteus-engined aircraft was worth working on, necessitating a further redesign with Bristol eliminating the Centaurus option. Senior figures within BOAC such as the Deputy Chairman Whitney Straight, however, considered the Proteus engine to be "an obsolete contraption". Despite the BOAC's desire to have a turboprop engine, the Type 175 project was contingent on the Proteus passing a 150 hour Type Test. The name, "Britannia" was chosen in April 1950 with Britannia 101 the designation for first two prototypes powered by the early series Proteus 625, the followup from the 600 series engine that had successfully completed its type trials. The first prototype, registered G-ALBO, with Bristol Chief Test Pilot A.J. "Bill" Pegg at the controls, flew for the first time on 16 August 1952 at Filton Aerodrome. The maiden flight was eventful as the overly sensitive flying controls led to a wild pitching before Pegg restored control. During the landing approach, smoke filled the cockpit and the main undercarriage boogie was stuck in its cycle, only fully deploying seconds before landing. The "snags" proved to be minor and by September, the prototype was cleared to perform at the 1952 SBAC Display at Farnborough where spectators commented on the "quietness" of the giant airliner. In November 1952, Popular Science reported that by 1954 BOAC would have 25 of these aircraft on routes such as London-to-Tokyo over the Arctic and North Pole. However, in 1953 and 1954, three de Havilland Comets crashed without explanation, and the Air Ministry demanded the Britannia undergo lengthy tests. Further delays were attributed to teething engine problems with the loss in December 1953 of the second prototype, G-ALRX, caused by a failed reduction gear that led to an engine fire and the aircraft landing on the mudflats of the Severn Estuary. Resolving inlet icing issues also took time. The first prototype G-ALBO was subsequently modified to more closely approximate a production standard but was retained by the company to undergo engine testing and development. 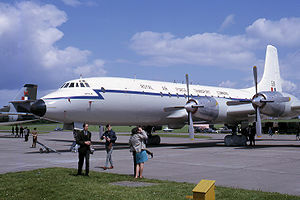 Bristol revised the design into a larger transatlantic airliner for BOAC, resulting in the Series 200 and 300, with the Britannia 300LR (Long-Range) seen as "eminently suitable" for BOAC's services between London and Sydney. Qantas had been considering purchasing a fleet of Britannia aircraft, but the extended development time had worn away the advantage the aircraft would hold until newer aircraft such as the Douglas DC-8 and de Havilland Comet 4 came onto the market. Route-proving trials continued through 1955, although orders were on the books from El Al and Canadian Pacific Air Lines as well as BOAC's standing order. During the first eight months of operational trials, a total of 16 in-flight engine failures and 49 unscheduled engine changes punctuated the ongoing engine dilemma and delayed the in-service date until February 1957, roughly two years late. The Britannia received a fair amount of attention in both the popular press and the British House of Commons, especially when it was revealed that BOAC had contemplated fitting Rolls-Royce Tynes to their fleet of Douglas DC-7s as an interim measure until the Britannia was cleared for service. In 1954, a licence was issued to Canadair to build the derivative Canadair CL-28/CP-107 Argus, and the Canadair CL-44/Canadair CC-106 Yukon. Based on the Britannia, the design of the Argus maritime patrol and anti-submarine warfare aircraft was optimised for endurance on long-range patrol, not speed, and used four Wright R-3350-32W Turbo-Compound engines, that used less fuel at low altitude. Unlike its Britannia forebear, the Argus was a hybrid using the Britannia wings, tail surfaces and landing gear matched to a "purpose-built", unpressurised fuselage. Another significant departure was being "Americanized", substituting North American materials and standard parts for British ones. The interior was heavily equipped with the tools to conduct anti-submarine warfare: navigation, communication and tactical electronic equipment along with weapon loads that included bombs, torpedoes, mines and depth charges. A total of 33 Argus aircraft were built in two series (Mk 1 and Mk 2), serving the Royal Canadian Air Force (RCAF) from 1957 to 1982. Canadair also built 37 turboprop Rolls Royce Tyne-powered CL-44 passenger/cargo variants for the civil market, most of which were used as freighters. Four were built as CL-44Js with lengthened fuselages for service with the Icelandic "budget" airline Loftleix�ir. Four CL-44D4s were also built with swing-tails to allow straight-in cargo loading and served with a variety of carriers, most notably Flying Tiger Line. The similar CC-106 Yukon was used by the RCAF in a solely passenger configuration. A final unique "one-off" development was the Conroy Skymonster, nicknamed Guppy, based on a Canadair CL-44D4 N447T. The most prominent modification was an enlarged fuselage, like the Mini Guppy which was produced by Jack Conroy's previous company, Aero Spacelines. 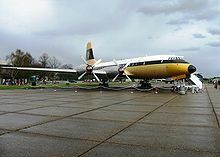 After a long operational career as a freighter, the Guppy was stored at Bournemouth Airport in 2003 and has recently been sold. Following an extended period of uneventful development flying trials and the fitting of a modified Proteus 765 series that greatly alleviated the number of breakdowns, a full Certificate of Airworthiness was awarded at the end of 1955. Consequently, the first two Model 102s were delivered to BOAC on 30 December 1955 for crew training. The Model 102 began scheduled service on 1 February 1957 with a BOAC flight between London and Johannesburg. By August 1957, the first 15 Model 102 aircraft had been delivered to BOAC. The last 10 aircraft of the order were built as Series 300 aircraft for transatlantic operations. In April 1959, a Model 102 Britannia was leased by BOAC to Ghana Airways for services between Accra and London, several more Britannias were purchased by the airline in the early 1960s. The Model 102 was eventually made available to other BOAC associates, including Cathay Pacific, Central Africa, East African, Nigeria and Malayan airlines. The next production series was based on the long-range, mixed passenger/freight Model 200 series that was intended for civil airline use but ultimately Bristol offered the series to the Royal Air Force (RAF) instead. The production series of three Model 252 and 20 Model 253 aircraft were purchased by RAF Transport Command in 1959, assigned the designation Britannia C.2 (first Model 252 series) and C.1 (Model 253 series). Those in RAF service were allocated the names of stars, such as "Arcturus", "Sirius" and "Vega". On retirement from the RAF in 1975, many Model 200 series were subsequently used by independent civil operators for cargo operations, harkening back to their original intended role. Although the Bristol Model 302 was constructed first as part of the original BOAC order, BOAC released this series to other airlines; Aeronaves de Mexico took two Model 302s which entered service in December 1957. The 18 Bristol Britannia 312s for BOAC were delivered from September 1957 with its service introduction made on the first ever non-stop flight from London to Canada on 19 December 1957. In late December 1957, BOAC began regular Britannia service on the transatlantic London-New York route. Other airlines, such as Israel's El Al, used the Britannia to establish their first transatlantic routes. In 1959 BOAC started flying the Britannia across the Pacific to Tokyo, extending their network round the world. On 1 April 1958, Canadian Pacific Air Lines took delivery of the first of six Model 314 Britannias, with an additional two Model 324s (built to a 320 standard) arriving later and sold to Cathay Pacific in 1961. BOAC ordered seven Model 302s but never took delivery, instead they were taken on by airlines including Aeronaves de M�xico and Ghana Airways. The main long-range series were the 310s, of which BOAC took 18 and, after deliveries began in September 1957, put them into service between London and New York; in March 1964 BOAC owned 50 aircraft, 10 being Britannia 312s. The 310 series (the Model 318) also saw transatlantic service with Cubana de Aviacix�n starting in 1958, in spite of the Cuban Revolution the airline had a special accord with British aircraft manufacturers to maintain this model of aircraft. In 1975 Cuban Britannias were used to transport hundreds of soldiers of the Cuban Revolutionary Armed Forces to Angola in Operation Carlota, a proxy war. Cubana de Aviacix�n continued using various Britannias until March 1990. Most aircraft were built by Bristol at Filton but 30 were built at Belfast by Short Brothers and Harland. Due to the extended development instead of a projected production of 180 Britannias, only 80 were sold. The negative experience with the development of the Britannia caused BOAC to be more cautious towards other British-made aircraft such as the Vickers VC-10.Throughout the Britannia's lifespan, the engine icing condition remained a "continual potential hazard" that flight crews ultimately learned to manage with a "high-lo" flight regime that minimized the danger, although the problems of the Britannia can mainly be linked to that of a manufacturer undertaking an innovative airframe design matched to an unproven engine, a design syndrome that remained particularly daunting. Squadron Leader David Berry who had 5,000 hours on the type characterised his experiences as flying "Beauty and the Beast." 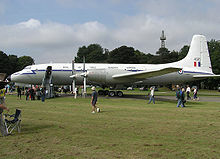 A more fitting epitaph was recently proffered by the editors of Aeroplane as the "100 Great British Aircraft" (2008) were analysed with the Bristol Britannia counted among the "greats". Mk 1 Prototype powered by Bristol Centaurus 662, fuselage length of 114 ft (35m), span 120 ft (36.5 m), seating for 48 passengers, not built Mk 2 Two prototypes powered by either Bristol Centaurus 662 or Bristol Proteus 600; with the Proteus, the fuselage length of 114 ft (35m) was fitted with a longer wingspan 140 ft (43 m) and reduced seating for 36 passengers, two prototypes planned, none built. 101 Prototypes, two initially powered by Proteus 625 and soon after re-engined with the Proteus 755, later the first prototype G-ALBO was used for development testing of the Bristol Orion in 1956 and the Proteus 765 in 1957. 102 Production aircraft for BOAC, 25 ordered with the last 10 cancelled in favour of the 300 series, 15 built. Picture - UK Ministry of Defence Britannia C2 (Model 253) on a visit to the maker's factory at Filton in 1983. As a civil airliner, it had flown for BOAC, British Eagle and Air Spain. All cargo variant with a 124 ft 3 in (38 m) fuselage, BOAC option for five was cancelled, none built. Similar to the 200 series, but mixed passenger and freight. 252 Originally ordered by the Ministry of Supply for intended lease to charter operators, but delivered to the Royal Air Force, as the Britannia C2. Fitted with a heavy-duty floor in forward area of fuselage and cargo door, three built. 253 Passenger/freight variant for the Royal Air Force, designated Britannia C1. Fitted with full length heavy-duty floor and provision for rearwards-facing seats as preferred by the RAF. Capacity for 115 troops or equivalent in cargo, 20 built. Aircraft later sold on the civil market as freighters designated Series 253F. Passenger only "stretched" version of the 200 series, incorporating 123 in. longer fuselage, capable of carrying up to 139 (originally 99) passengers, medium-fuel capacity. One Filton-built company prototype, used the same wing and fuel capacity of the Model 100; first flew: 31 July 1956. Belfast-built production, 10 ordered by BOAC but cancelled in favour of 305; seven were begun to this standard with two delivered to Aeronaves de Mexico. Five Belfast-built 302s modified for longer-range but with limited takeoff weight due to thinner fuselage skin and lighter landing gear. Originally ordered by Capital Airlines which were cancelled and then for Northeast Airlines which also cancelled. All modified to other variants. One former Series 305 leased to El Al pending delivery of last Series 315. Later converted to Series 307. Two of the ex-BOAC Northeast 305 order (one formerly the El AL Series 307) to Air Charter Limited September 1958 and March 1959, with a new designation: Model 307. Later to British United Airways. 1960's conversion of 307 to freighter (both converted). Two former 305s ordered by Transcontinental SA of Argentina in 104-passenger configuration. 1960's conversion of 308 to freighter for British Eagle (both converted). One former 305 leased to Ghana Airways). As 305 series, but with strengthened fuselage skin and undercarriage. Long-range fuel capacity and was originally known as 300LR. One prototype originally known as a 300LR. Production aircraft for BOAC, 18 built. 1960's conversion of 312 to freighter (five converted). Production aircraft for El Al, four built. Production aircraft for Canadian Pacific Air Lines, six built. Production aircraft for Hunting-Clan Air Transport in 124 passenger trooping configuration, two built. Production aircraft for Cubana de Aviacix³n, four built. Delivery taking place on 15 December 1958, later one leased to Cunard Eagle in 1960-1961 and this same airliner leased to CZA in 1962. Last production Britannia sold to Ghana Airways, modified from original Model 310/311 series. Variant for North American market, order for Trans World Airways not concluded, two built were completed as Series 324s. Two Series 320s built for Canadian Pacific Air Lines, later purchased by Cunard Eagle in 1961. CSA leased two aircraft from Cubana de Aviacix�n (1961-1964 and 1963-1969). Globe Air operated two former El Al 313s between 1964-1967. Fourteen Britannias were lost with a total of 365 fatalities between 1954 and 1980. The worst accident was the 1967 Nicosia Britannia disaster with a loss of life totaling 126 "souls on board". On 4 February 1954, the second Britannia prototype crashed at Severn Beach, Gloucestershire. During the test flight, beginning with a loss of oil pressure, the No. 3 engine was shut down and restarted with a fire breaking out that could not be contained, consequently, No. 4 was shut down as a precaution. On approach to Filton Airport, there was concern that the uncontrolled fire would lead to a failure of the main spar, the pilot electing to make an emergency landing on the mudflats of the Severn Estuary. There were no fatalities. On 6 November 1957, the 300 series prototype crashed during a test flight, killing the 15 occupants. On 12 October 1957, "Sirius" a Royal Air Force C1 was damaged beyond repair after over-running the runway at RAF Khormaksar, Aden. On 22 July 1967, a Canadian Pacific Air Lines Britannia 314 was damaged beyond repair during an attempted "go-around" at Hickam Field, Hawaii. On 29 February 1964, another Britannia 312 crashed into the Glungezer mountain near Innsbruck killing all 83 people aboard. On 1 September 1966, a Britannia Airways Britannia 102 crashed while landing at Ljubljana, Slovenia, resulting in a total of 98 fatalities of 117 passengers and crew. The probable cause was the flight crew having failed to set their altimeter to QFE instead of QNH, creating a 980 feet (300 m) error in indicated altitude. On 20 April 1967, a Globe Air Britannia 313 was on a flight from Bangkok to Basel with intermediate stops at Colombo, Mumbai (Bombay) and Cairo. The crew didn't fly to Cairo, but elected to fly to Nicosia instead, where a missed approach and subsequent low circuit ended in impact near the airport perimeter. On 16 February 1980, a Britannia 253F crashed at Billerica, Massachusetts, shortly after taking off from Boston. The probable cause of the accident was degraded aerodynamic performance beyond the flight capabilities of the aircraft resulting from an accumulation of ice and snow on the airframe before takeoff and a further accumulation of ice when the aircraft was flown into moderate to severe icing conditions following takeoff. Contributing to the cause of the accident were encounters with wind shear, downdrafts, and turbulence during the climb. Of eight crew and passengers on board, there were seven fatalities with one seriously injured. Britannia 101 (G-ALRX) Forward fuselage is on display with the Bristol Aero Collection at Kemble Airfield, England. Britannia 308F (G-ANCF) Removed from Kemble, and reassembled in early 2007 in Liverpool, England. Under restoration on the former airside apron behind the Crowne Plaza Liverpool John Lennon Airport Hotel, which was the original terminal building of Liverpool Speke Airport. Britannia 312 (G-AOVF) On display at the Royal Air Force Museum, RAF Cosford, England, in Royal Air Force Air Support Command colours as XM497 "Schedar". Britannia 312 (G-AOVT) On display at the Imperial War Museum Duxford, England, in Monarch Airlines colours. Britannia C.1 (XM496) Regulus On display at Kemble Airfield, England, in RAF colours. An Aeronaves de Mexico Model 302 Britannia was the aircraft in the 1959 movie Jet Over the Atlantic; the audience is informed that the aircraft is a turboprop. Angelucci, Enzo. World Encyclopedia of Civil Aircraft. London: Willow Books, 1984. ISBN 0-00-218148-7. Barnes, C.H. Bristol Aircraft since 1910. London: Putnam, First ed., 1964. Berry, David. The RAF Britannia and Its People: 1959 to 1975. Startley, Chippenham, UK: Keyham Books, 1996. ISBN 0-9527715-4-3. Carvell, Roger. "Database: Bristol Type 175 Britannia." Aeroplane, Volume 33, No. 8, August 2005. Donald, David, ed. The Encyclopedia of World Aircraft. Leicester, UK: Blitz Editions, 1997. ISBN 1-85605-375-X. Eastwood, Tony and John Roach. Turbo Prop Airliner Production List. West Drayton, UK: Aviation Hobby Shop, 1990. ISBN 0-907178-32-4. George, Edward. The Cuban Intervention in Angola, 1965-1991: From Che Guevara to Cuito Cuanavale. London: Routledge, 2005. ISBN 0-41535-015-8. Gunn, John. High Corridors: Qantas, 1954-1970. Self-published, John Gunn, 1988. ISBN 0-70222-128-7. Guttery, Ben R. Encyclopedia of African Airlines. Self-published, Ben Guttery, 1998. ISBN 0-78640-495-7. Hayward, Keith. The British Aircraft Industry. Manchester, UK: Manchester University Press, 1989. ISBN 0-71902-816-7. Jackson, A.J. British Civil Aircraft since 1919: Volume I. London: Putnam, 1974. ISBN 0-370-10006-9. Littlefield, David. A History of the Bristol Britannia: The Whispering Giant. Tiverton, UK: Halsgrove, 1992. ISBN 1-87444-801-9. Oakey, Michael, ed. I00 Great British Aircraft. Aeroplane magazine, London: IPC Media Ltd., 2008. ISSN 0143-7240. Orlebar, Christopher. The Concorde Story. Botley, Oxford, UK: Osprey Publishing, 2002. ISBN 1-85532-667-1. Oughton, James D. Bristol: An Aircraft Album. London: Ian Allan Ltd., 1973. ISBN 0-71100-387-4. Piggot, Peter. On Canadian Wings: A Century of Flight. Toronto: Dundurn Press Ltd., 2005. ISBN 1-55002-549-X. Taylor, H. A. "Britannia... End of the Bristol Line". Air Enthusiast Twenty, December 1982-March 1983. Van Riper, A. Bowdoin. Imagining Flight: Aviation and Popular Culture (Issue 7 of Centennial of Flight Series). College Station, Texas: A&M University Press, 2004. ISBN 1-58544-300-X. Woodley, Charles. Bristol Britannia (Crowood Aviation Series). Ramsbury, Marlborough, Wiltshire, UK: The Crowood Press, 2003. ISBN 1-86126-515-8.